Looking for viola recordings, I visited many websites that sell CD or downloadable recordings. Some don't have many recordings of viola music, some require you to provide your credit card details when you register, others have many recordings but you can't listen to music samples, but one that I like and I'm introducing to you today is ClassicsOnline. They have a lot rare recordings, historical recordings and exclusive bargains to download, their classical music catalogue has over 1 million tracks from more than 50,000 albums and what I like most is that I can listen to all music samples. This week there is a viola gift! Get a free viola recording, quick! This week's free track is from a viola concerto, the Rondo from Hoffmeister viola concerto in D major, a really lovely piece. Hoffmeister was also a publisher, one of Mozart's and Beethoven's friends and published some of their works. You need to register, but membership is free, no credit card is required unless you decide to buy, and after you register you can download 5 tracks for free. Also you get a free track every week and access to exclusive free classical deals when you subscribe to their newsletter. When you buy tracks you earn point that you can then use to buy tracks. You need to download the Download Manager, which is a small piece of free software that downloads all your music files with one click and places them in the folder that you choose on your computer. After you've done this, get your free track, the Rondo from Hoffmeister viola concerto by clicking on the cart image. This will add your free track to the cart, then you have to go to the cart, which is a bit hidden at the top of the page, where there is a tiny writing, Shopping Cart. Click and there you can finally download your free track. 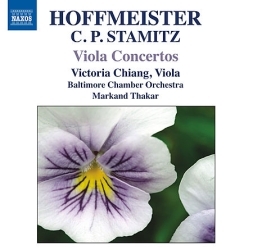 This is a good opportunity to get to know a classical viola concerto and You can listen to samples of all other tracks that include the concerto in D major, another less known concerto by Hoffmeister, in B flat major, and the Stamitz Viola concerto. If you like it, you can buy the whole album, If you'd rather buy the physical CD, it's here.